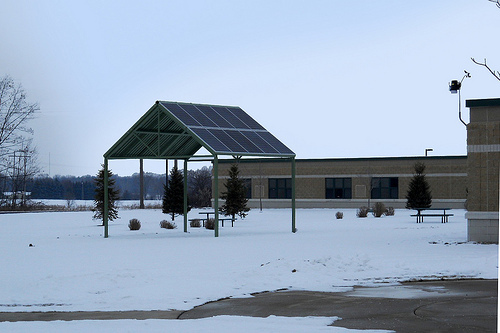 Alma Middle School embodies environmental sustainability through multiple projects at their school. Two of the projects they are most proud of are their recycling program and their community garden. The recycling program is completely run by the students, which Alma hopes encourages the students to practice this in their own homes. The community garden is used as an introduction to Biology and environment sustainability in classrooms, which provides students with a unique approach to learning. This hands-on approach will also be utilized with their new 2kW Solar PV Pavilion. Since monitoring began 12/28/2010, this system has generated 8,369 kilowatt hours of clean energy.